The first week of winter saw auction volumes fall, with 2,545 homes taken to auction, compared to 2,885 the previous week. 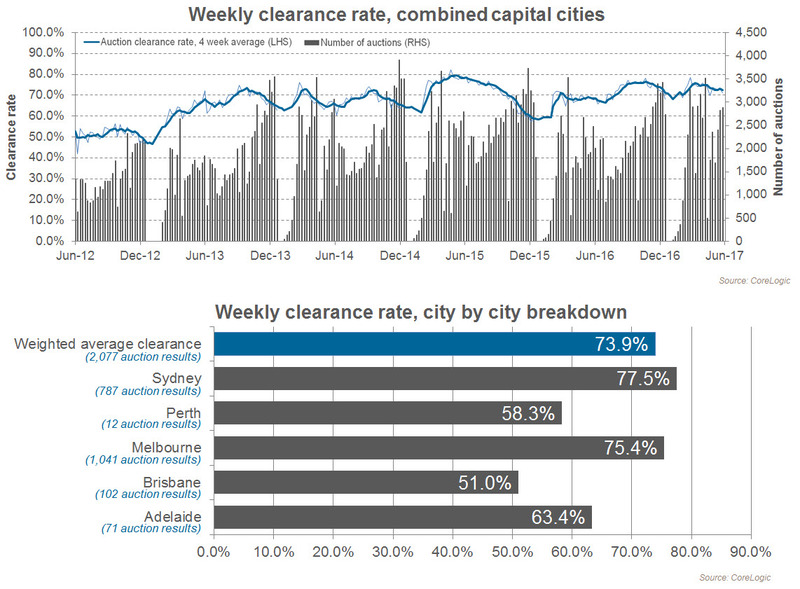 The preliminary clearance rate across the combined capital cities was higher (73.9 per cent) compared with last week’s finalised result, which was the third lowest clearance rate so far this year (71.3 per cent). With auction clearance rates typically revising lower as more results flow through, the final clearance rate is likely to be lower than what was recorded last week. At the same time last year, both the combined capital city clearance rate and the number of auctions were lower, with 2,008 auctions held and 68.2 per cent reported as successful. The two largest auction markets, Melbourne and Sydney, saw their preliminary clearance rates rise compared with last weeks finalised results, with Sydney at 77.5 per cent and Melbourne at 75.4 per cent. Across the smaller capital city markets, week-on-week results show mixed results with clearance rates falling in Brisbane and Canberra. Across Melbourne, 1,181 homes were taken to auction and preliminary results show a clearance rate of 75.4 per cent, increasing from last week when the final clearance rate fell to 74.2 per cent across 1,366 auctions, the lowest clearance rate for the city so far this year. At the same time last year, Melbourne’s clearance rate was 71.1 per cent, with 970 auctions held across the city. Looking at Melbourne’s sub-regions, the Inner region was the busiest for auctions across Melbourne with 227 homes going under the hammer, followed by the Inner South (180) and the West (156). The West region was the best performer in terms of clearance rates, with a 83.5 per cent success rate. Sydney’s preliminary auction clearance rate increased to 77.5 per cent from 72.7 per cent last week, while auction volumes were lower this week with 1,000 homes taken to auction, compared to 1,101 last week. At the same time last year, both the clearance rate and auction volumes were lower with 692 homes taken to auction and a clearance rate of 72.9 per cent. Across Sydney’s sub-regions, the Outer South West, where 13 results have been reported so far, recorded a preliminary clearance rate of 38.5 per cent, while across Blacktown (89.5 per cent), Inner West (88.5 per cent) and Sutherland (88.4 per cent), the success rate of reported auctions was much higher. There were 146 auctions held across Brisbane this week, down from 162 last week, and higher than one year ago (130). Preliminary results for the city show that 51.0 per cent of auctions were successful this week, up from 52.2 per cent last week, while one year ago 48.2 per cent of auctions were sold. Further south, across the Gold Coast, 56 auctions were held over the week and 37 have been reported so far with a 32.4 per cent clearance rate. A total of 107 auctions were held in Adelaide this week, down from 112 last week, and up from 98 last year. Preliminary results for the week show 63.4 per cent sold, up from 57.6 per cent last week. Across Perth, preliminary results show 58.3 per cent of the 12 reported auctions were successful, while one week ago 50.0 per cent of Perth auctions were successful and one year ago just 13.0 per cent were sold. There were 78 auctions held in Canberra this week and the preliminary clearance rate was 71.9 per cent, down from 73.8 per cent last week and similar to one year ago (71.1 per cent). A total of 4 auctions were held in Tasmania this week and so far there have been no reported results.